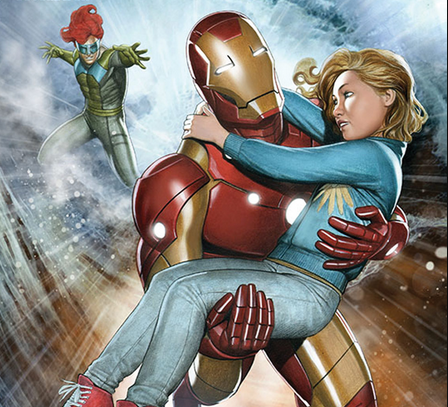 Marvel Comics is helping raise awareness on childhood diabetes with a special Iron Man comic book. In a partnership with Siemens, a medical diagnostics company, the publisher has released “Iron Man: Early Warnings.” It’s your typical PSA-powered comic, for the “Become a Diabetes Hero” program. The program helps raise awareness towards diabetes in young children, and what patients can do to treat the condition. In the comic, Iron Man cracks down on the two-bit villain Aqueduct while developing a Stark Industries-powered device known as the “Health-Y-Meter.” The device detects when a person—you guessed it—isn’t feeling so healthy, as evidenced through the comics’ diabetic child, Daisy. After Iron Man whips Aqueduct, he and Pepper teach Daisy that all diabetics need to eat right and exercise for a healthy lifestyle. You can read the entire comic here. The comic is written by David Liss with interior art by Kev Sharpe. Ari Granov provides the cover, which is actually pretty awesome. And hey, the Bleeding Edge armor makes a return!